Ever since starting college, I always feel exhausted. Which is a common theme among college students. 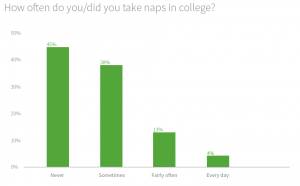 Basically college students are in a constant state of sleep deprivation. I began to wonder if exhaustion is just a simple fact of college or if there are things to do to prevent this. Getting enough sleep affects mental health and grades. Students who are sleep deprived can also gain weight, sometimes caused by midnight snacking. Due to sleep being so important, students should try and make more room for it. 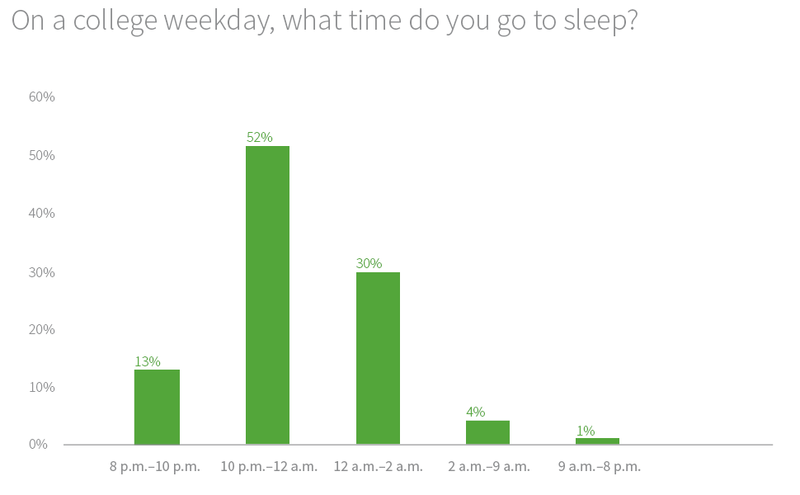 Students lose so much sleep mostly due to procrastination, as I know from first hand. The common theme among students is they either get no sleep or sleep too much. Either way, students are essentially getting nothing done. You have a midterm tomorrow, what do you do? You stay up all night studying and become more stressed, losing sleep, and when it’s time for the test you’re not at your best. Students who cram for tests, tend to get lower test scores. Is procrastination the only reason for less sleep? What would happen if students didn’t procrastinate? Would they get more sleep? In my own experience first hand, procrastination is not the only reason for my lack of sleep, it’s a number of things. I live with six other roommates and it takes until about 2:00am for everyone to settle down. This leaves me with an automatic 5-6 hours of sleep a night, if I’m lucky. I also have a very chaotic sleep schedule. On weekends I try and sleep until 3:00pm. Which is also bad for me. 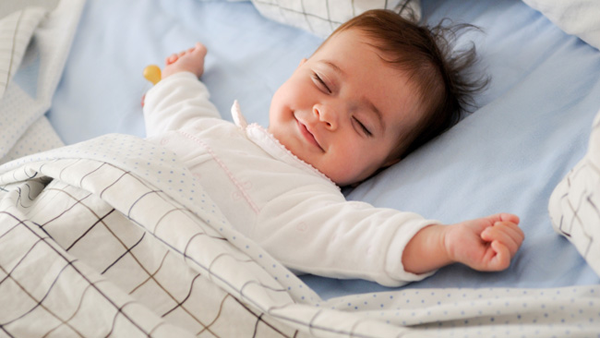 According to Kelchi Lynn Lucier, getting the same amount of sleep each night is the best thing for your body. It is a good idea to make a sleep schedule that fits everyday of the week and sticking to it. Which can be very hard for those who have an 8am everyday. Who wants to wake up at 7:00-7:30am everyday, especially on the weekends? I love naps. Naps have to be the best part of my day. But I began to wonder if naps were actually good or bad for me. I started to believe naps were bad for me, especially because my naps usually last for 3 hours. For these 3 hours, I could be doing homework or going to the gym. Basically just doing anything productive. But naps can actually help catch up on sleep. Naps help me get through the day. But sometimes my long naps affect my bedtime. Power naps can actually be very beneficial though, without affecting the rest of your day too much. Power naps prevent the groggy, lazy side effect that are mostly associated with long naps. Some things to avoid before bed is things like caffeine (obviously). Although this is obvious many college students live on energy drinks. This disrupts sleep immensely, even if students sleep after drinking caffeine, the person has a disturbed sleep and doesn’t get a full night’s rest. Also avoid watching television or going on your phone right before bed. I am guilty of this. My nightly routine includes going through all my social medias before bed. But the lights in electronics, like your cell phone, your laptop, and your TV delays the sleep hormone, melatonin, preventing sleep. Thirty minutes before bed, tuck away your phone, close your laptop, and turn off your TV and you will have a great nights rest. The body needs eight hours of sleep a night. If it does not receive the proper amount of sleep, not only will grades and ability to process information be impaired. But health risks come into play as well. Like high blood pressure, a blow to the immune system, more susceptible to the flu or a getting (often explaining the freshman plague), weight gain, etc. All health systems are put at risk when the body does not get enough sleep. 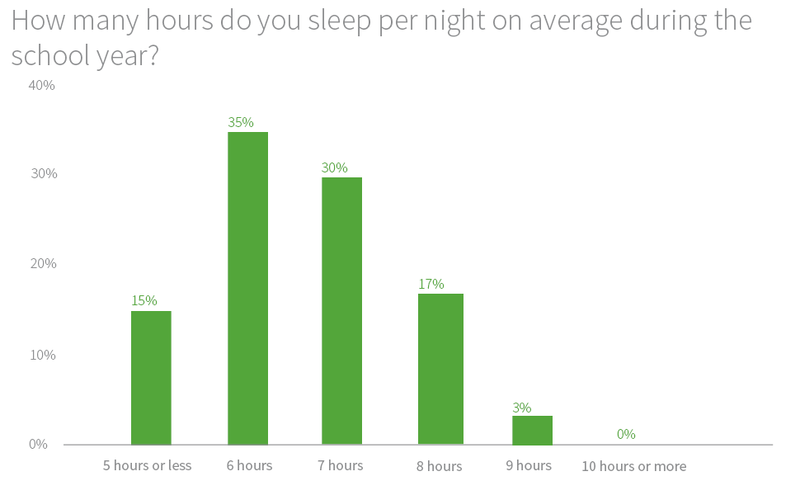 This study done by Ink Niche shows that only an astonishing 17% of college students gets 8 hours of sleep a night. Sleep is not like homework, you can’t catch up on it on in one night. All nighters can disturb your sleep all week. If you pull an all nighter to get that project you’ve put off for a month, you ruin your sleep schedule for a whole week. You can’t catch up on sleep, it is just better to get your work done early, and stick to a sleep schedule. Your grades greatly depend on your sleep. The best thing is to get a good eight hours of sleep a night, while sticking to the same sleep schedule each night. Students who sleep better at night perform better in their classes, tests, and quizzes. I am going to start by not using my phone or my laptop before bed and sticking to the same sleep schedule, since it has been all over the place lately. Sleep is a difficult subject to justify about, get too little and and you suffer from mental and psychological issues, get to much and you can have chemical imbalances and increase chances of having certain diseases. 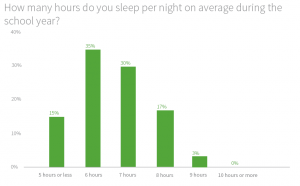 Overall, I think that this is a very good question to ask because many college students are put into this situation of having to much sleep or not having enough of it. Assuming you are a freshman, I remember being in the exact same situation freshman year. A night owl, I would stay up until 2 or 3am and then be forced to wake up at 7 or 8am for class, leaving me with 4-6 hours of sleep per night. I would then come home and do nothing but nap between classes. This resulted in poor health and a poor GPA. This year, sophomore year, I have cut out naps almost entirely from my daily routine. I think I’ve napped twice so far this year, both times when sick. My grades have drastically improved, as well as my mental and physical health. The key to not napping is to keep yourself out of bed! I don’t spend any time in my bed until bedtime. Occupy your day and stay active. This makes not napping a piece of cake. I also agree with the comment above, definitely leave your phone on your desk while you sleep! Staying on your phone at bedtime will make precious hours you should be using to sleep fly by. I have always wondered if people were kidding when they said they got no sleep in college. Boy were they not joking! I have always found comfort in my mid-morning naps but I was never quite sure whether I was benefiting or not! I later found out that 30 minute naps were considered powernaps. Anything longer than a 30 minute naps had a negative affect. Since you can’t really “catch up” on sleep, sleeping for a random hour and half a 2 pm won’t do much! It actually tricks your pineal gland and can make you more tired! Check out this app that regulates your sleep patterns and makes it easier to wake up in the morning!!! I swear by it! I really do think sleep is important,especially in college. However it is way easier said than done to get eight hours of sleep. I for one really don’t sleep much, not only because of homework and studying, but because of the commotion in my room. Sure I can turn off my appliances but that’s not stopping my room mates. I think only 17% of college kids get eight hours of sleep because it’s very difficult in a new environment. Of all the posts that I’ve read from the class blog, this may be one of the most relate-able. In high school, even if i went to bed at 2 or 3 in the morning, I was (still very tired) but quite able to get out of bed, get ready and head to school. However, since I’ve been in college I find myself not going to bed until around 2 am nightly and it seems harder each day to wake up for classes as late as 10 and 11:15. As a result I’ve had to make some changes to my daily life to compensate for constantly being tired. I now do my best to make it to the gym in the morning before i go to class, which makes me more focused throughout the day and makes it easier to fall asleep at night. I’ve also been trying to kick the habit of using electronics like my phone and watching TV while in bed because while we may not take notice to it, these distractions can have a strong impact on your ability to fall asleep.